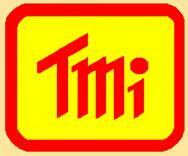 Anemometers - Air Flow - Electrical & Environmental Test Equipment | T.M.I. Anemometer : 0.4 to 35 m/s,ft/min, Km/h, Knots, Min/Max, Memory, CMM, CFM, Temp in C/F, Large LCD dual display, RS232, Heavy duty metal vane. Notes on Air Velocity Sensors in Anemometers. Anemometers can be handheld instruments and are used for air velocity measurements using air velocity sensors. Air velocity flow sensors can be inserted into a duct or pipe through an access hole to measure air velocity. In other instances a capture hood is used to measure volumetric flow from a grill or exhaust diffuser. Air velocity or volume measurements can often be used with engineering handbook data or design information to reveal proper or improper performance of an airflow system. Two types of air velocity flow sensors are the insertion probes and balometers or flow hoods. Insertion probes go directly into a duct to gauge the effectiveness of ventilation by measuring air velocity. Flow hoods and balometers measure air volume flow at the air supply or exhaust outlets. Different technologies are used with air velocity flow sensors. A thermal anemometer is a body that is heated up to a fixed temperature and then exposed to the air velocity. By measuring how much more air is required to maintain the original temperature, indication of the air speed is gained. The higher the air speed, the more energy required to keep the temperature at a set level. Differential pressure type sensors have Pitot tubes, averaging tubes and other velocity pressure measurement devices. The velocity pressure is the difference between the total pressure and the static pressure. A Pitot tube has two pressure sampling points, static pressure and back pressure. Used with a differential pressure transmitter, the difference between these pressures is a measure of the velocity. Vane anemometers have a proximity switch that counts the revolutions of the vane and supplies a pulse sequence that is converted by the measuring instrument to a flow rate. This is based on the conversion of rotation into electrical signal and can be either a rotating or swinging vane. 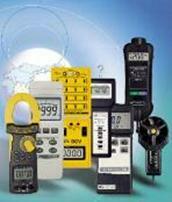 Measurement ranges are important specifications, whether measuring air velocity, volume or pressure. Accuracy for air velocity flow sensors is usually expressed as a percentage of full-scale measurement. These instruments can be either handheld devices, for ease in moving from one location to another, or permanent fixtured units. Some models of air velocity flow sensors can have selectable measuring ranges. Another option is time or multi-point averaging functions to compensate for non-uniform air velocity across the duct cross-section. They can also measure temperature and be temperature compensated. Outputs for air velocity flow sensors can be analog voltage, current or frequency. They can also have switched or alarm output and can even be connected to computers for data collection and programming. Other control and programming options are through an analog or digital front panel. Displays for these sensors can be analog, digital or video terminals. Anemometer : 0.8 to 30 m/s, ft/min, km/h, knots with data-hold. Compact ABS Housing. Fast, accurate, low friction ball vane wheels. Anemometer : 0.4 to 30 m/s, ft/min, km/h, knots with data-hold, Fast, accurate, low friction ball bearings. Anemometer : Metal Vane, Heavy Duty. 0.4 to 35 m/s, ft/min, km/h, knots with data-hold, Fast, accurate, low friction ball bearings. Air Flow: CMM, CFM, Temperature.